Puritan’s Pride, one of the leading health supplements and vitamins brand in the USA, is now available in the Philippines via Puritan’s Pride Philippines. By offering the best price, up to 35% lower than other brands, Puritan’s Pride Philippines helps you become healthy on a budget. You are also assured of high quality as we only use ingredients from suppliers that meet our stringent Quality Assurance Standards and GMP food quality standards. 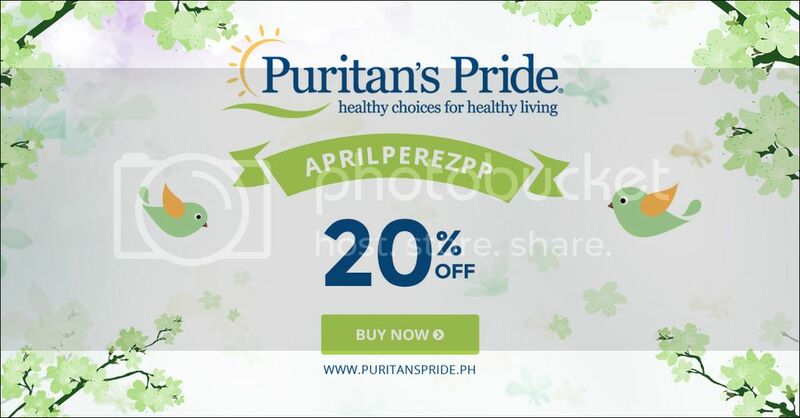 To help you jumpstart your journey to a healthy lifestyle that is within your budget, use the code APRILPEREZPP for a 20% discount off your 1st purchase. You can use this code on their website www.puritanspride.ph during checkout. This code is valid only until June 30, 2016. DISCLAIMER: I am not, in any way, affiliated with Puritan’s Pride. Products were sent for PR purposes and for review consideration. I have yet to try these products hence, no review will be posted for now. For questions on how I conduct my reviews, please refer to my disclosure policy.